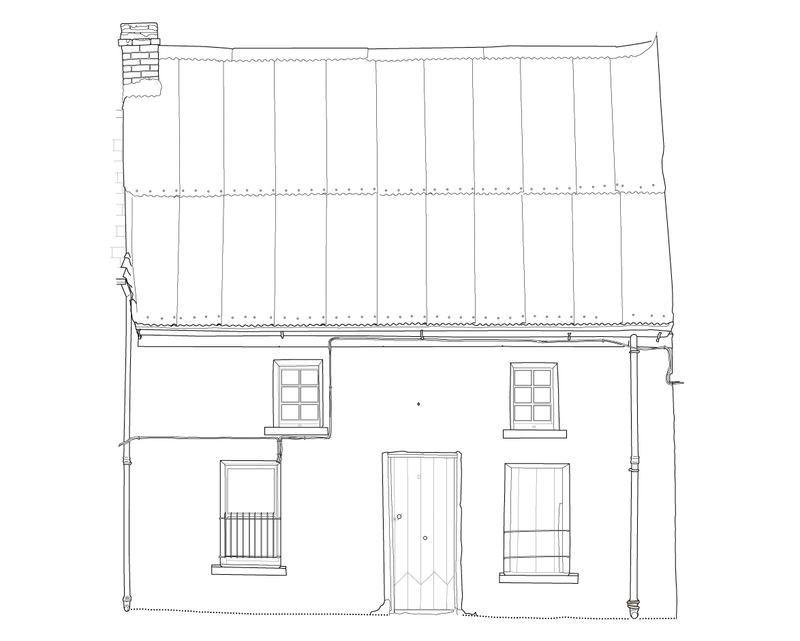 Front elevation drawing of The Forge (Survey: Brian Mac Domhnaill, Illustration: Jonathan Millar, 2005). To pre-empt any outrage at the loss of such a nice little building I thought I should put the demolition of The Forge in context. Our collective appreciation of the charm, beauty and homeliness of these old houses is evident in some of the imagery we use to promote our island. Postcards portray what is held dear to us in our landscape and streetscape and what we believe visitors will find most appealing and memorable. However if we are to be honest with ourselves it is false advertising. In Ireland domestic vernacular architecture of the 18th and 19th centuries often falls short of archaeological and architectural concerns. If these buildings are not directly associated with important historical events or persons, there is no legislation worth talking about that affords them any comprehensive protection. In terms of the archaeological record these buildings simply aren’t old enough. From an architectural standpoint these buildings are not representative of any great technical achievement nor are they of a style that is glamorous enough. There is, however, a grey area of false hope in advance of planning permission in which somebody somewhere knows that something isn’t right and that something should probably be done but they aren’t quite sure what it is or who should do it. Out of this ambiguity comes the deployment of the ‘archaeological desk-based assessment’. When applied to a building or site, the findings of these documents tend to highlight the archaeological, architectural or historical importance of the property, if any, in terms of its past and extant remains. Curiously these ‘assessments’ are often used as disguised exercises in affordable preservation by record rather than true assessments of significance. My own direct involvement in these assessments has left me feeling decidedly uncomfortable, knowing that my work in some instances has provided a green light for the demolition of our built heritage. 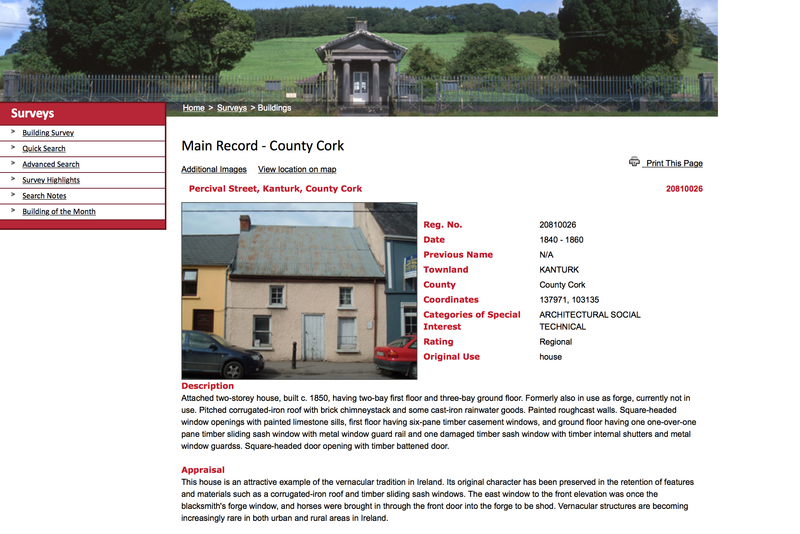 NIAH entry for The Forge on http://www.buildingsofireland.ie (Accessed April 2015, 9 years after demolition). The Irish system of getting buildings onto the Record of Protected Structures (RPS) is grossly inadequate. As a nation we are obliged under the Granada Convention to identify, survey and protect our built heritage. This is why we have The National Inventory of Architectural Heritage, a state initiative under the administration of the Department of Arts, Heritage and the Gaeltacht. Despite the hard work and best intentions of the NIAH and their subcontractors, the preservation of our built heritage is still at the mercy of local government, who under no real legislative pressure can abuse the situation with drastic consequences. The weakness in the system is clear in the underlined text below. The purpose of the NIAH is to identify, record, and evaluate the post-1700 architectural heritage of Ireland, uniformly and consistently as an aid in the protection and conservation of the built heritage. NIAH surveys provide the basis for the recommendations of the Minister for Arts, Heritage and the Gaeltacht to the planning authorities for the inclusion of particular structures in their Record of Protected Structures (RPS). The published surveys are a source of information on the selected structures for relevant planning authorities. They are also a research and educational resource. It is hoped that the work of the NIAH will increase public awareness and appreciation of Ireland’s architectural heritage (NIAH 2015). This is why The Forge could be demolished. It was only on a list of buildings that the NIAH, on behalf of the minister, recommended to the local authority for inclusion on their Record of Protected Structures. Having being identified by the NIAH and surveyed by a subcontractor to highlight its significance The Forge was still not automatically protected. For that to happen we would need a law, criteria and enforcement, as opposed to an aid, a source of information and recommendations. Next PostNon-archaeological desk-based assessment of completed development. Hey Brian, great site, some really interesting stuff there. Keep up the good work !